We strictly implement our cancellation policy and NO REFUND will be given in any case, even for cancellation/delay of flights/boat. It is recommended to get a good travel insurance that will cover any unexpected inconveniences during your trip. Please note that our cancellation policy is set out to be fair to the guest whilst compensating us for lost booking opportunities brought by the cancellation. We cannot take responsibility for the change of your travel arrangements. A refundable security deposit shall be asked upon check in, which will be Php 1,000 per room booked. Extra bed for the 4th adult is only allowed in the Family room, php 1,000.00/night , daily breakfast included. Children of 7 years old and above are regarded as adults and must have their own bed. Children below 7 years old are allowed to stay for free when sharing bed with parents. Breakfast of sharing child is NOT included. Airport transfer is NOT included in the price. Write us your flight details and let us know whether you'd wish a shared transfer (php 200/person) or a private one (php 1,800/way max of 6 pax, php 2,300 max of 10 pax). If you choose a shared van transfer, you may have to wait for other passengers to arrive and wait for them to be taken to other resorts before you can get here to La Natura Resort. If you don't want to wait but go straight to the hotel, you can either pay for the private transfer or get first to Coron Town and then take a trike from there. take a tricycle just outside the pier. It will take you approximately 25 minutes to get here and standard fare is php 200-250/way (not per passenger). Money, jewels and other valuables are brought to La Natura Resort at the guest's sole risk. La Natura Resort and the management accept no liability and shall not be responsible for any loss or damage thereto, guests remain solely responsible for the safekeeping of any such items. Damage and loss of hotel items will be charged to guest's account accordingly. Notwithstanding any method of payment, the guest agree that he/she is personally liable for all costs and charges incurred in the event that any such costs and charges are not paid in full and confirm that it is his/her responsibility and liability in that regard is not waived or released in any way. He/she consent the usage of his/her personal information for administrative and marketing purposes. The hotel guarantees not to disclose any information to third parties and affiliated companies. Please send scanned version of official deposit receipt at info@lanaturaresort.com. 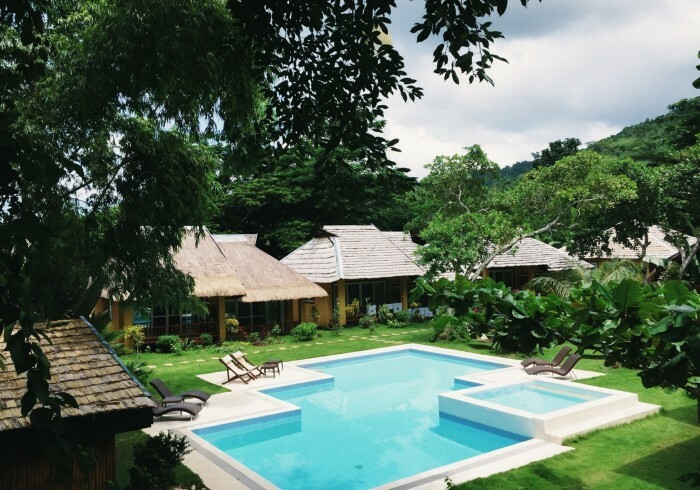 Flowers, flowing water, butterflies, tropical birds, are the smell, sounds and colors of La Natura Resort, an alternative choice in the tourist’s market of Palawan. Situated just 15 minutes away from the proper town and the sea, La Natura Resort’s location was strategically taught to provide you a peaceful and serene holiday, away from the noise and pollution and yet very near to every major tourist spots. At La Natura Resort you will be able to enjoy a stress and worry free vacation as we can arrange your stay and activities in Coron directly from our front desk. Birdwatching, hiking, mountain biking, jogging are some of the activities we can organize for you, as well as exclusive island hopping tours, explorations in the most wild and uncontaminated places in Busuanga and dives to discover Japanese shipwrecks populated with colorful and bizarre creatures. Our staff will be more than happy to attend all your needs. Contact Name : Giellian M.